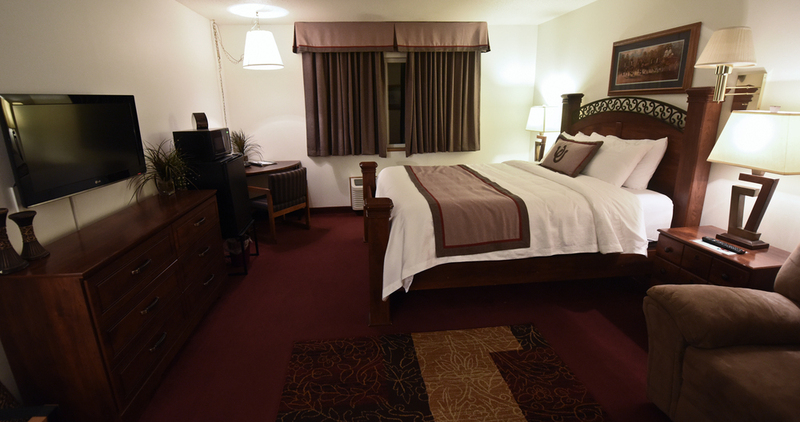 Featuring one queen sized bed, a recliner and work desk, these rooms have the space and flexibility to satisfy any visitor. 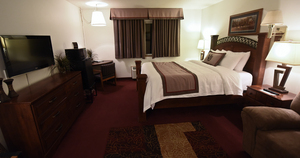 All single queen rooms are equipped with an HD flat screen TV, high speed internet, small fridge and microwave. Also help yourself to our small continental breakfast every morning in the designated breakfast area. (Note: All rooms in this facility are non-smoking). 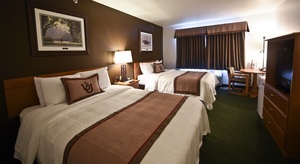 This room offers two queen sized beds, a large HD flat screen TV, microwave, fridge, and high speed wireless internet. Also be sure to help yourself to our small continental breakfast every morning in the designated breakfast area. (Note: All rooms in this facility are non-smoking). If you're looking for a touch of extra luxury why not treat yourself to our single queen whirlpool suite? The two-person whirlpool tub is the perfect way to relax after a long day in meetings, and also makes a nice addition to a romantic evening! This room contains a queen sized bed, love seat and work desk. This room has the space and flexibility to satisfy any visitor. You'll also find a HD flat screen TV, high speed internet, small fridge and microwave. Be sure to help yourself to our small continental breakfast every morning in our designated breakfast area. (Note: All rooms in this facility are non-smoking). This large one bedroom efficiency suite features a big open layout great for those extended stays or if you're just looking for some extra space to relax. Equipped with one queen size bed, a sleeper sofa, one roll away bed, and a large desk/work station area. The small kitchenette and dinning area features a microwave, refrigerator and small dining table. Be sure to help yourself to our small continental breakfast every morning in our designated breakfast area. (Note: All rooms in this facility are non-smoking). Perfect for family visits, hunting groups or extended stays, this fully equipped suite is a real home away from home. Featuring 2 separate bedrooms with one queen bed in each room and a living area with full sized sofa sleeper, it offers the perfect combination of space and privacy. There's also a fully equipped kitchen with refrigerator, 4 burner stove, coffee maker and microwave. - in fact everything you need to cook what you like, when you like. Also enjoy free high speed internet and spacious work stations to finish those late night business emails. Be sure to help yourself to our small continental breakfast every morning in our breakfast area. (Note: All rooms in this facility are non-smoking). These flagship suites are perfect for family visits, hunting groups or extended stays. A true home away from home, featuring 2 separate bedrooms with 3 queen beds and a living area with full sized sofa sleeper, it offers the perfect combination of space and privacy. There's also a fully equipped kitchen with refrigerator, 4 burner stove, coffee maker and microwave. - in fact everything you need to cook what you like, when you like. Also enjoy free high speed internet and spacious work stations to finish those late night business emails. Be sure to help yourself to our small continental breakfast every morning in our breakfast area. (Note: All rooms in this facility are non-smoking).